As the next few posts will show, this weekend is all about running. 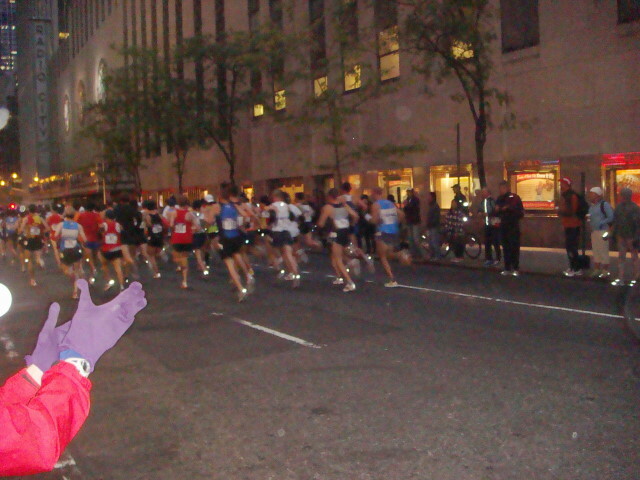 Saturday morning at 7:36, the US Olympic trials for marathon runners was held. And Famous Ankles was there….as an observer, of course. I arrived well before the start. 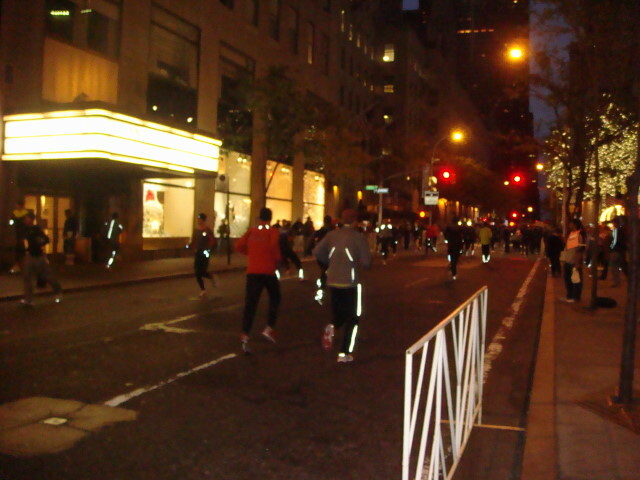 The run was to go from Rockefeller Center on 50th Street to 6th Avenue, cut south to 42nd, go to Times Square, then north to Central Park and then around the inside roads about four times. My original thought was to go to Central Park and catch them from there. 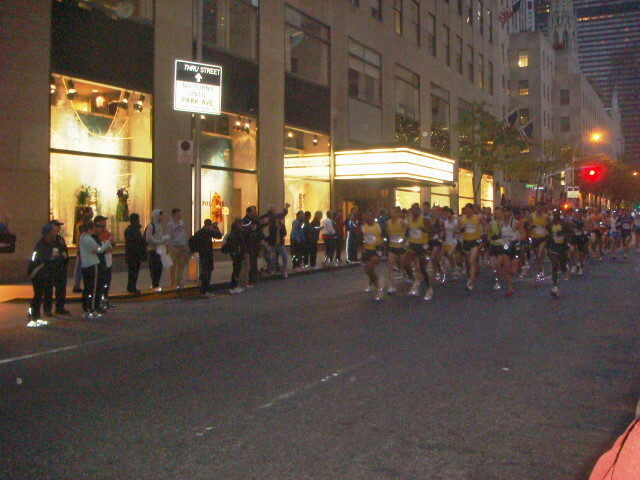 I then thought that it might be great to see them run through Times Square (as I’ve seen the half-marathoners do). As I was walking to the area, I noticed that there was almost no one around on Sixth Avenue and figured that the crowds would be less than I expected. So, I decided to see how close I could get to the beginning. The answer: pretty close, indeed. That’s some of them. When I first got there, I thought these were wannabes while they kept the real athletes warming up someplace else, but that only lasted a few seconds. I never could figure out a count, but there were a bunch of guys looking to fill just a couple of spots on the Olympic team. I did talk with one of them, but it was just a “How ya’ doin? Good luck out there. Thanks, appreciate it.” sort of exchange. The day was cool/cold at about 45 degrees F. But the wind was a killer. Fifteen to 20mph. I didn’t envy any of them. I did get to the actual beginning point of the race, but didn’t stay there. The crowds were pretty significant. Not overwhelming, but a bunch of die-hard supporters. Lots of cowbells. Lots of them. 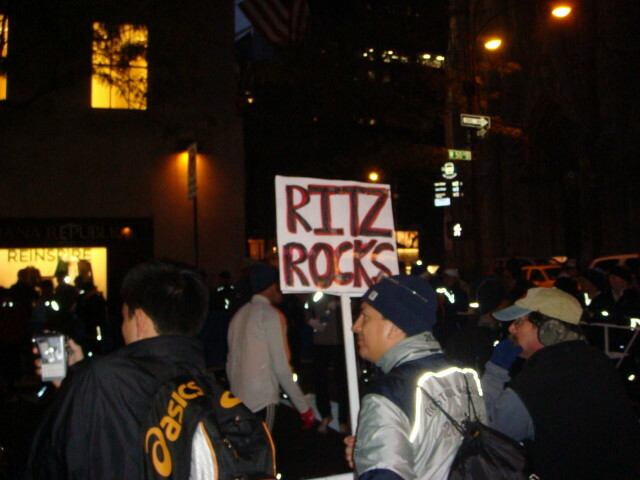 I don’t know who “Ritz” is (presumably Dathan Ritzenhein, who ended in second place), but the sign of Ritz Rocks was the only sign I saw. 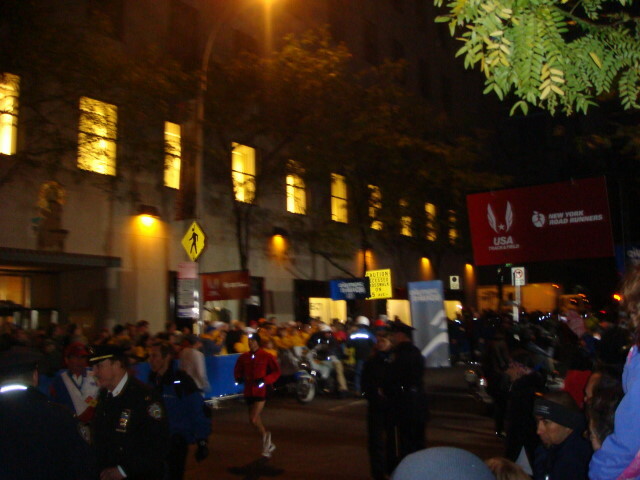 Nevertheless, this was a crowd that seemed to know the runners. I’m not sure why I got that feeling because I never saw anyone conversing directly with the runners, but it was a family-type atmosphere and very friendly. The guys, it was the men’s trials, were very intense, though. You have to remember that this may have been the most important day of their lives (at least professionally). 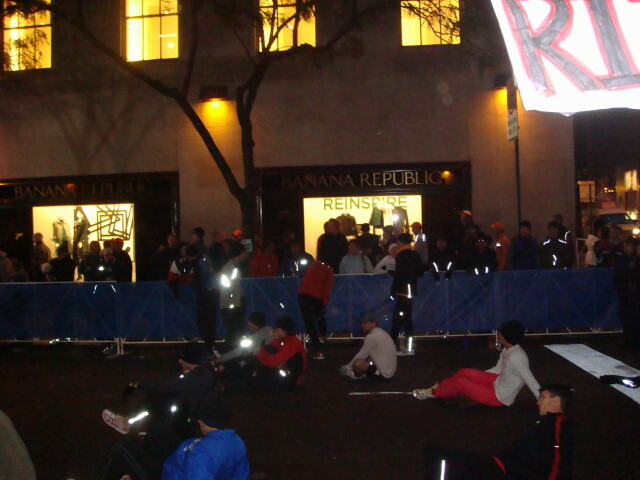 Below, was above the start line and a number of the runners were lying down and doing their stretching. At about 7:30am, the cops started to clamp down more and more. The tension in the crowd grew and everyone was really expectant. There was a shot and the run started. 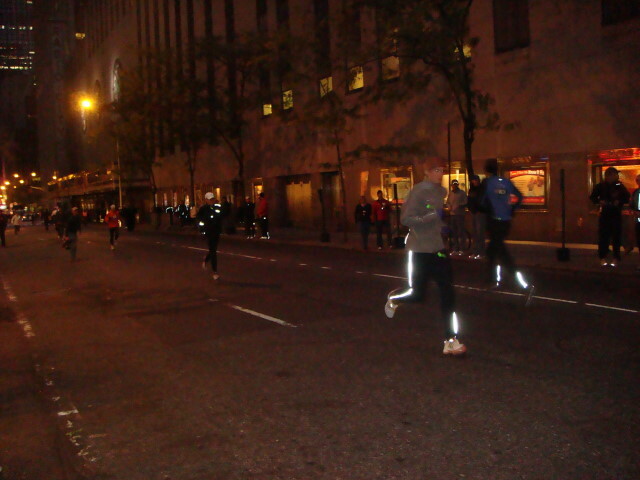 That’s my first picture of the runners. Here’s my second. That was as fast as my camera could take pictures in that light. I even had to brighten these two photos to bring out the detail. The actual passing by lasted about five seconds. The crowd instantly broke up. I heard a number of people talking about going out to Central Park, but I had other places to go. But that’s for a later post. Much later in the day, I learned that one of the runners, Ryan Shay, died during the race. I’m shocked and saddened by that. These guys all seemed in perfect shape, Olympian shape. If you look at the picture of the runners as they were coming toward me, I believe Mr. Shay is the runner in the front, toward the right, wearing a white sleeveless shirt. My sympathy to his family and friends. This entry was posted on November 3, 2007 at 7:28 pm and is filed under Events, Manhattan, Mid-town. You can subscribe via RSS 2.0 feed to this post's comments. You can comment below, or link to this permanent URL from your own site.